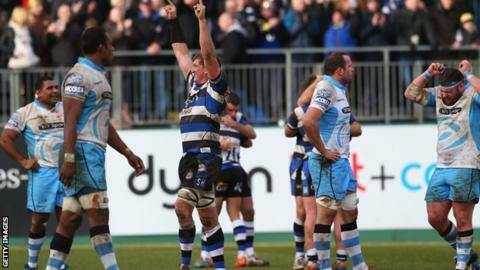 Captain Stuart Hooper has taken Bath to the European Champions Cup quarter-finals for the first time since 2009. Bath will "embrace" the challenge of facing three-time winners Leinster in the European Champions Cup quarter-finals, says coach Toby Booth. The West Country club beat Glasgow on Sunday to join Premiership rivals Saracens, Wasps and Northampton in the knock-out stages. Bath will travel to Dublin to face Leinster in April. "Ideally we would have loved to be at home but we'll embrace any challenge that's put in front of us," said Booth. He told BBC Somerset: "They'll be very committed at home and very confident, but if we want to become the team we want to be, we need to challenge ourselves against the best. "We've done it in the group stages and we'll certainly have to do it again in the knock-outs." Bath's 20-15 win over Glasgow saw them top of Pool Four, following Toulouse's 27-26 defeat by Montpellier, and they became the first side to ever qualify for the quarter-finals after losing their first two group games. "To be the first team to ever do that speaks volumes about what we've achieved. We're delighted with the outcome," added Booth. "It was fraught and we needed to find a lot of inner-resolve. It shows what it meant to the boys and it made a significant difference being at home." Glasgow, second in the Pro12 table, twice went on the attack in the final minutes of Sunday's game, but a try-saving tackle from Jonathan Joseph and a turnover from Francois Louw made sure of Bath's progression. Captain Stuart Hooper was full of praise for his side's resolve. "The try-line defence showed what we're all about. It's about competing on every play and making sure every action you have in the game makes a difference to the team," said the 33-year-old lock. "When you're playing for a place in the last eight in Europe, you've got to fight for everything. Every inch of contact, every shoulder in every scrum - you have to fight for it. "I'm massively proud of the lads and so chuffed."